Since ancient times, Apitherapy is a common practice that uses Bee Venom to enhance the normal functionality of articulations and improve the problems related to the delicate articular areas. High concentration, for rapid and long lasting results: this jar contains a quantity of Bee Venom corresponding to about 70 bee stings. 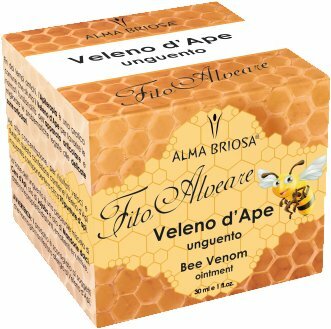 The ointment contains bee venom, which, thanks to its content in mellitin, is useful to promote normal function at the level of the articular delicate areas. - Cellular regenerator in cases of psoriasis. The ointment base is a pleasant mixture of Beeswax, Jojoba oil and Sweet almond oil, used for their hydrating, softening and nourishing properties. WARNING: This product is not recommended for people who have expressed an allergy to Bee Venom. INCI	 INGREDIENTI/INGREDIENTS: Butyrospermum parkii butter**, Prunus amygdalus dulcis oil**, Cera alba**, Simmondia chinensis seed oil*/**, Bee venom**.